Uncategorized | Laura Freed ! Obama will be visiting a local company owned by Joel Glickman. On Friday, November 30, he’ll be at the Rodon manufacturing facility; 2800 Sterling Drive in Hatfield. Mr Glickman, according to stories, keeps his manufacturing in the USA. But if Obama is such a cheerleader for the USA – why did Obama make Jeff Immelt (CEO of G.E.) the President of his jobs council? GE hasn’t paid taxes and ships jobs to China! Can you say total HYPOCRISY? Why? Because he’s all about photo ops – not hard work. Oh yes, taxing the 2% will keep pay Washington’s bills – for 8 whole days. Wowza. 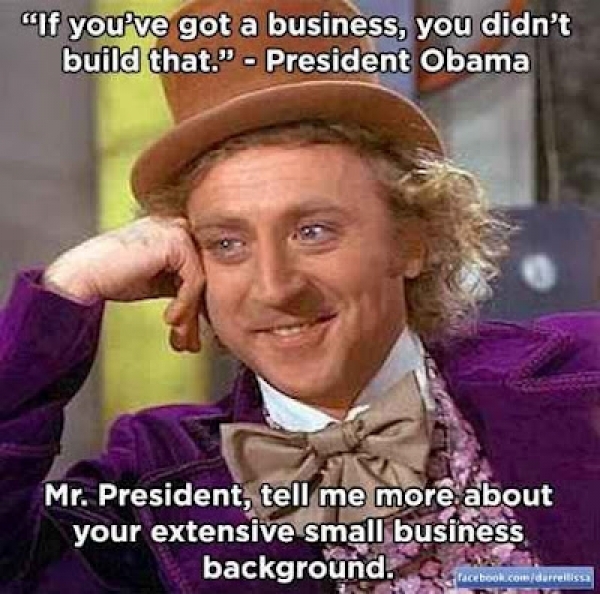 Obama is no different than Bush when it comes to crony capitalism. Bush was about banks & finance – and Obama puts all tax payer money into Green Companies owned by big Obama bundlers/donaters. Coach Andy Reid and Obama are total failures who continue in a position of power because people refuse to acknowldege reality,they follow blindly and continue to believe in luck. Believing Obama will lead this Country into prosperity is about as smart as believing Andy Reid will lead the Eagles to the Super Bowl. The Jews motto after Hitler is “Never Again!” – and yet – they see ALL of Obama’s actions against Israel – and his help of the Muslim Brotherhood and they fall all over themselves to kiss his feet. Zombies? Stupid? Ignorant? I think a mixture of all 3. I stood outside holding a poster listing things Obama has killed (like jobs, the economy, coal, the USA citizens (one a teenager) killed in a Drone attack) – and the very “tolerant” Left had some very hostile things to say to me…and one man got physical with me (see the video below). The Drudge Report and Breitbart.Com posted the video to show the intolerance and hypocrisy Democrat war on Women, anyone?) – but even though I, along with several people, sent the video to local newspapers and news stations they didn’t touch it. The better to help Obama – and hinder Jews. The Republican Jewish Coalition is having a Townhall Meeting at the same location. I do hope I see some Democrats who I saw during the summer, that have woken from their Zombie sleep and finally realized Obama is NO friend to hard working Americans, and certainly no friend to Jews and Christians. featuring; Senator Norm Coleman Former, White House Press Secretary Ari Fleischer, RJC Executive Director Matt Brooks. Jimmy wrote several articles for Big Hollywood. Go to Breitbart.com and plug his name in the Search feature and Jimmy’s articles pop up. Jimmy reached out to me after discovering my blog. 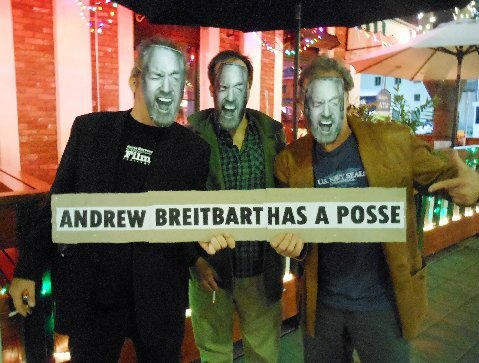 In an effort to continue Andrew’s legacy, he’s created t-shirts to honor Andrew; to show America that Andrew Breitbart is still HERE and he lives among the best of us. 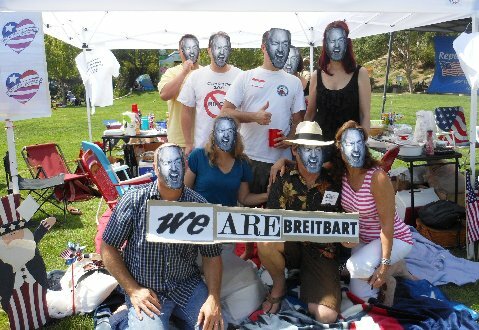 Jimmy sent me a Breitbart T-Shirt. I love it. I love it, I love it, I love it. Not only because it’s a statement, but also because I know that the person who created it knew Andrew, loved Andrew, and continues to champion Andrew’s fight. I’m now ordering a black t-shirt (he sent me a white one) because I know I’ll be wearing my first t-shirt EVERYWHERE! And it is white. And I like to eat anything BBQ. I grew up right outside the great city of Boston, where the three most important things in people’s lives are sports, politics and revenge. Politics are kind of in my blood. I can recall, as a kid, very passionate discussions, between the adults in my life, whenever the subject reared it’s thorny head. I’ve been involved as an activist for many years on a number of issues. The key for me has been to educate myself best as I can, take a stand, then take action. When I led the fight against the proposed expansion of our local regional airport back in the early 90’s, I was at city council meetings on a regular basis. Wore the badge of gadfly with honor. One morning, in January of 2009, shortly after the launch of Big Hollywood, I got an email from Andrew along with his phone number and the words, “call me”. I was taken by surprise but after I called and we spoke for about 15 minutes, I knew I was gonna to be ok. He talked to me about a group of like minded people, who worked in the entertainment industry, that I would soon become part of. I knew that he, along with a small army of new friends, would have my back from there on in. Not long after our phone conversation, at his invitation, I became a contributor and wrote my first article for Big Hollywood, ‘Conservatives: A Love Story’, in which I shared the story of my moving from the Left to the Right. Live life. With passion. With energy. With humor. Each day, do the best you can. Love your family along with your country. Don’t take things for granted. Today is all we’ve got. Tomorrow…only God knows. Andrew lived life balls out…that works for me. I am, for the most part, an optimist, so I tend to look at things as being half full. To make anything better in life, a person should have a good attitude, work hard to the best of their ability. The stakes for the future of our country have never been higher. As the great Speaker of the House, Tip O’Neill, once said, “All politics is local”. Find a way. Get involved. No excuses. I’ll go with a nice thick juicy NY steak, a hot buttered baked potato and a simple green salad. Maybe something chocolate for dessert. Although, a couple of thin crust NY style slices of pizza are hard to beat. Add an ice cold Dr. Pepper (lots of ice please) and I’m a happy guy. Aw man, that’s so tough. I love all kinds of music. From Sinatra to The Beatles to Paul Weller. Beethoven, Vivaldi, Howlin’ Wolf, Etta James, Sam Cooke, Chris Connor, Keith Jarrett, Nat King Cole, you name it. Movie soundtracks. Depends on my mood…what’s going on that day. Could be Chet Baker, Bobby Darin, Paul Westerberg, one minute then something from Motown the next. The Supremes, Righteous Brothers, Curtis Mayfield, then maybe a taste of Hendrix, Jeff Beck, Van Morrison, Dave Clark 5, The Beach Boys or The Who. And blast it! The same as with food and music. What am I hungry for? Without a doubt, in 1961,’The Guns of Navarone’, started the ball rollin’ for me, when I was 8. Gregory Peck, Anthony Quinn, David Niven, magic up there on the silver screen. For me, goin’ to the movies was like goin’ to church. I went to see that movie every afternoon on our Christmas school vacation. Drove my poor mother nuts. Years later, when I became an actor, she kind of understood. 1973, it was Scorsese’s ‘Mean Streets’. Same thing, went to see it 54 times. My mother thought I was insane but after that film, I just knew I was gonna be an actor. Other favorites include, ‘Mr. Smith Goes to Washington’ ‘The Man Who Shot Liberty Valance’ ‘On the Waterfront’ ‘Mister Roberts’ ‘The Apartment’ ‘Hud’ ‘The Dirty Dozen’ ‘Cool Hand Luke’ ‘Wait Until Dark’ ‘The Party’ ‘In the Heat of the Night’ ‘Midnight Cowboy’ ‘The Friends of Eddie Coyle’ ‘The Godfather Part I &amp; II’ ‘Inside Moves’ ‘O Lucky Man!’ ‘A Woman Under the Influence’ ‘Chinatown’ ‘Taxi Driver’ ‘Rocky’ ‘Network’ ‘Being There’ ‘Raging Bull’ ‘Once Were Warriors’ ‘Wings of Desire’ ‘Lost in America’ (think I’ll stop there with the hope that come November we’ll remember and once again we’ll find America). 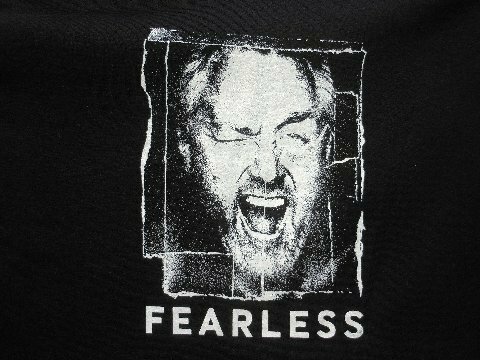 T-shirt info: If you are interested in purchasing a FEARLESS T – they come in Black/25.00 (with white ink) or White/20.00 (with black ink) S/M/L/XL. A PayPal account is available for payment.